I’m so excited! Tomorrow morning I am leaving for New Jersey to attend 2 workshops, “Messengers and Storytellers” and “The Unfolding Pyramid”, taught by polymer clay/mixed media artist Dayle Doroshow. Dayle’s beautiful creations speak of ancient civilizations. I hear that she is a very inspirational teacher so I am looking forward to absorbing and learning as much as i can. 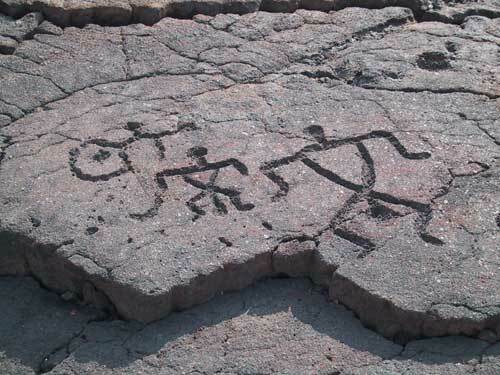 In honor of Dayle and her inspiration from ancient civilizations, here is a photo that I took of petroglyphs at the Waikoloa Petroglyph Preserve on the Big Island in Hawaii. It was amazing to see a whole field of lava rock filled with these ancient figures. These carvings are estimated to be anywhere from 200-1000 years old. This entry was posted in Inspiration, Polymer Clay. Hope you have a great time at your workshops! Thanks Lone Beader! I hope you enjoy reading my next post about the art dolls I created at the “Messengers and Storytellers” workshop. Look for more posts about art dolls and the unfolding pyramid I made, too!